That white flaky stuff our friends back east tell us about has finally reached Southern California. As the rest of the country is starting to bundle up for the dark, cold, snowy, sleet-filled winter, Southern Californians are still sporting shorts and flip-flops. Well, not all Southern Californians. Out in San Bernardino, snow has already arrived. 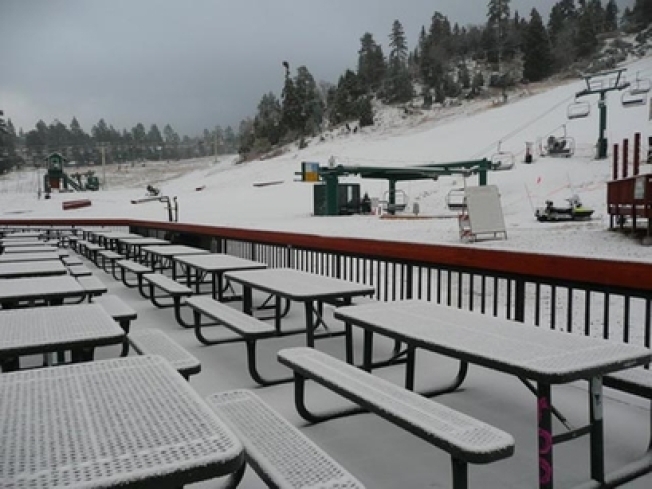 It wasn't much, just a half-inch, but the first real snowfall of the year has prompted Big Bear businesses to optimistically start hoping for an "early winter." Typically this is marked by having both Bear Mountain and Snow Summit open and doing a brisk business by Thanksgiving weekend, which is just a week and a half away. Recent cold temperatures have allowed Bear to make enough snow to get Chair 5 and their Central Park run opened up two weeks ago. Now, with that half-inch of "natural snow" from mother nature and forecasted low temperatures falling into the 20s the next few nights they'll have the snow-making machines cranking overtime to add to what's already on the mountain as well as expand coverage to at least one or two more runs. With limited coverage, Bear Mountain is offering lift tickets at less than half price. Early season rates are $25 for adults, $20 for young adults and just $10 for children. Ideal snow-making conditions are expected the next few nights and then, late next week, there's a slight chance a couple of weak storms could drop a couple of inches of the "real thing" on the mountain just in time for the first big holiday of the season; and you better believe the resorts at Big Bear are well aware that most schools are on vacation starting November 23. For a preview of what's going on at Big Bear, check out this link and maybe take advantage of some of the special rates.